As the first person in her family to obtain a Bachelor’s Degree, Christy Lansford, the newly appointed Coastal Bend College Foundation Executive Director, realizes the importance of education. One of her first jobs out of college was as a 4-H extension agent in New Mexico where she helped guide youth towards a more successful path. She did this by helping them build leadership skills and participate in programs that provided them better opportunities. That first job helped pave the way towards a career where she strives to help others succeed every single day she goes into work. “I want to be surrounded by students and help them be successful. I can be a great advocate for those students, and I can advocate for what they need to succeed here at Coastal Bend College,” Lansford explained. Lansford brings with her to CBC over a decade of experience working for non-profit organizations and helping youth gain skills and confidence to succeed in life. 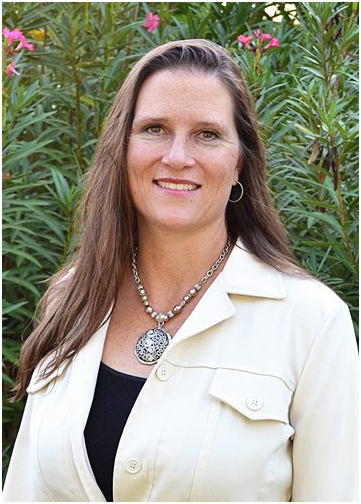 Her experience spans from being the Chief Executive Officer of Youth Programs for the American Quarter Horse Association to being the Administrative Director for the Independent Cattlemen’s Association of Texas. She also holds a Bachelor of Science and a Master of Arts degree from New Mexico State University. Now in her new role as the CBC Foundation Executive Director, she looks forward to rebuilding the foundation from the ground up and improving its reputation and impact on the college and the community it serves. The purpose of the CBC Foundation is to help promote and further CBC’s mission, goals and values by directly supporting the college through fundraising for student scholarships, faculty development and improvement programs. Lansford has hit the ground running by meeting with CBC administration, faculty and staff, as well as community members to hear their ideas for improving the CBC Foundation. She is also working alongside the very dedicated members of the CBC Foundation Board of Directors to begin laying out a strategic plan for the next year and beyond. Also on her to-do list is to organize the Foundation’s first fundraiser with her as Executive Director. When asked where she sees the Foundation a year from now, Lansford stated that she hopes the Foundation will have clear, measureable goals and objectives to work towards, as well as at least one successful fundraiser completed. However, in order to be a viable Foundation and make an impact on student success and the community, the Foundation relies heavily on monetary donations to help fund student scholarships and events. Lansford is dedicated to making sure all donors know what is happening with their money at all times. All donors, from here on out, will receive reports about their donations directly from Lansford, and donors can also specify which program they’d like to see their donation go towards such as vocational programs or athletics. Since the Foundation is being rebuilt under new leadership, this is a great opportunity for anyone in the community to get involved. There are a variety of ways to help the CBC Foundation—monetary donations of any size, sponsorships, volunteer work and simply spreading the word about the Foundation are good ways to get involved and make a difference on the lives of all those who attend classes at CBC. Overall, Lansford is excited about taking this opportunity at CBC and making the move to Beeville with her family. Her husband, T.R. Lansford, is a veterinarian and has worked for the state of Texas his entire career. They have a 2-year old son named T.R “Buddy” Lansford IV, and also own a ranch in South Texas. Agriculture is something she and her family are very passionate about and active in. But lately what’s she most passionate about is the potential that she sees in the CBC Foundation, and the warm welcome she’s received from all the faculty and staff at the college. To see how you can help the CBC Foundation, or if you’d like more information, contact Christy Lansford, Foundation Executive Director at (361) 354-2447 or toll-free at 1-866-722-2838 ext. 2447 or you can visit her at the CBC Beeville Campus on 3800 Charco Road inside the Robert J. Beasley, Jr. Administration Building, office A-139B.